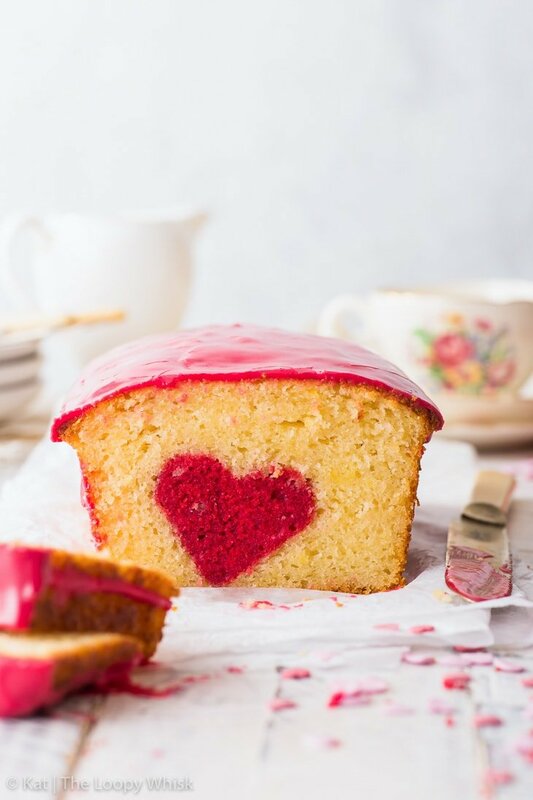 Simple to make and guaranteed to impress – this “hidden heart” Valentine’s cake should be at the top of your Valentine’s Day desserts list. 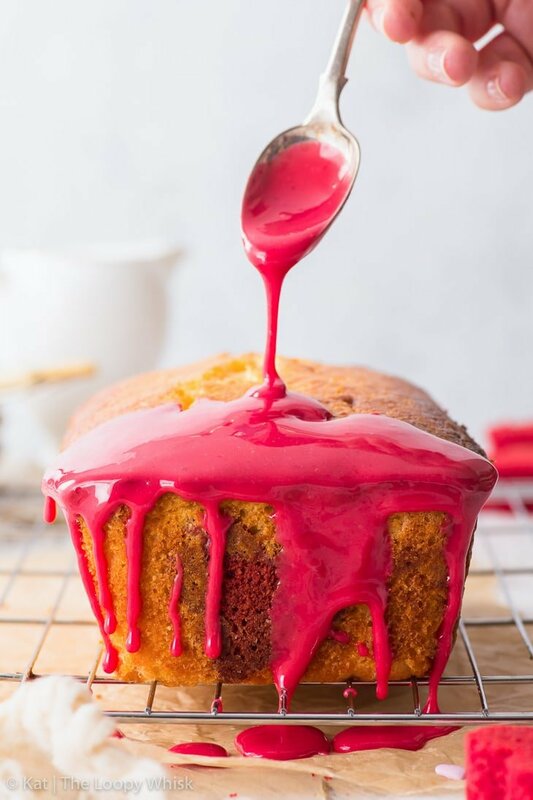 A gorgeous, delicate lemon sponge meets a raspberry flavoured hidden design, and the pretty pink raspberry drizzle finishes off a truly wonderful (gluten free!) dessert. 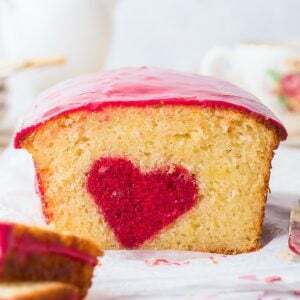 There’s four-tiered elaborately decorated cakes with sugar flowers and delicate piping work and 4,237 individually placed sugar pearls… and then, there’s this simple Valentine’s loaf cake with its pretty pink glaze and its all-important wow factor – the hidden heart design found in every slice. As I’m sure you can tell, I’m partial to the latter. 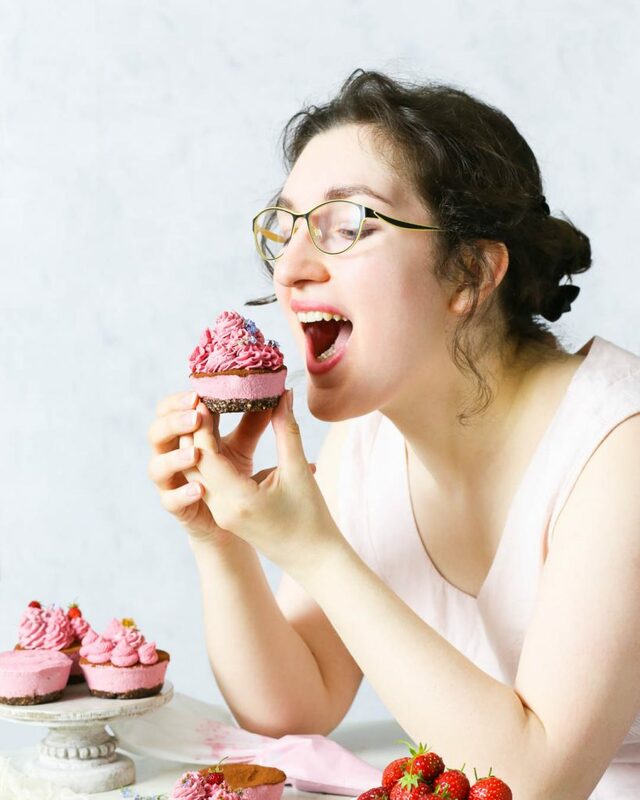 Here’s the thing: the most memorable desserts I’ve had in my life – they were never the highly polished, perfect masterpieces, closer to art than food. Not at all. They were simple and delicious and always left you craving more. Now, don’t go confusing “simple” with “boring”. 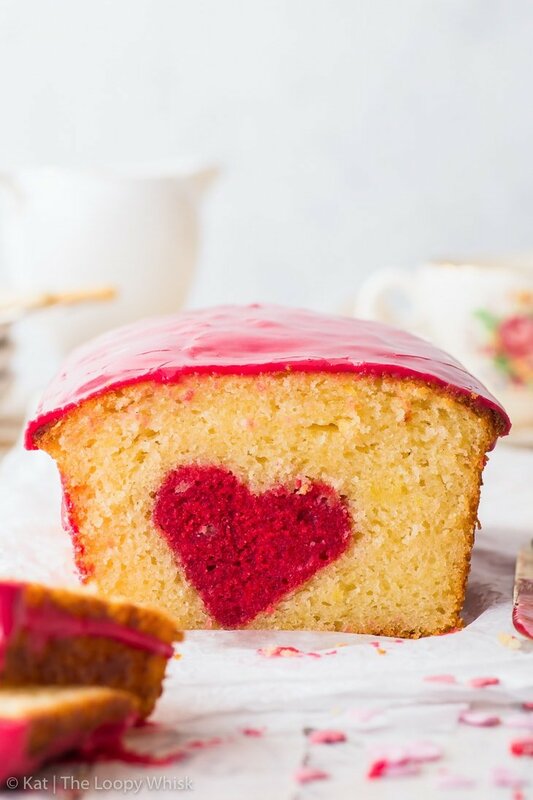 Because let me assure you: there’s nothing boring about this pretty Valentine’s cake. 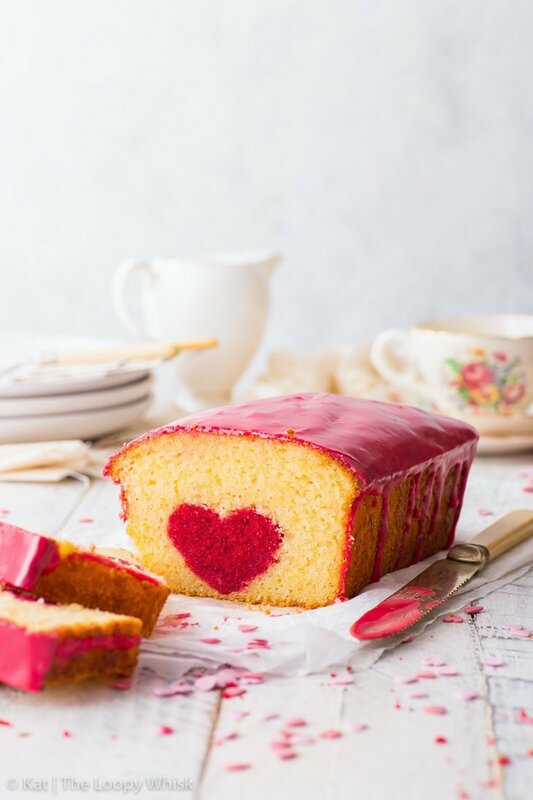 From its delicate, fragrant lemon sponge and the raspberry heart centre all the way to its caramelised edges and the vibrant pink raspberry glaze – this Valentine’s Day dessert is the very definition of memorable. WHOA, wasn’t expecting that! So. Beautiful. Of course, getting that hidden heart design into the centre of the cake may look like an impossible undertaking. Magic. Witchcraft. Baking hocus-pocus. Psst! It’s actually SUPER EASY. 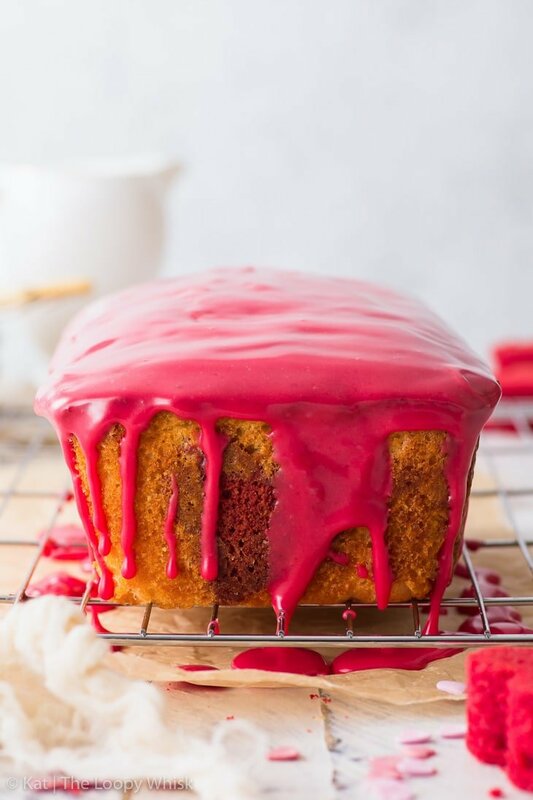 Baking a separate sponge – in this case, a vibrant pink raspberry sponge. Then, once it’s cooled, you cut out the hearts using a heart-shaped cookie cutter. Then, just pour the rest of the batter around them. Before you start panicking about the batter on the photo below looking curdled and lumpy – that’s because of the lemon juice in the batter starting to react with the baking powder (you can read more about it here). The final sponge will be picture perfect, promise. Smooth out the top, and into the oven it goes. 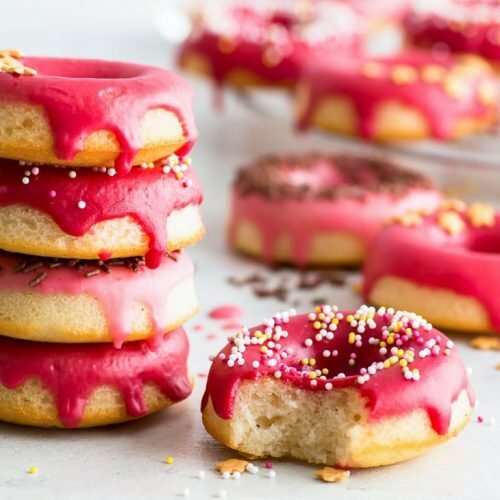 The raspberry drizzle is a simple mix of powdered (icing) sugar, lemon juice and raspberry reduction. 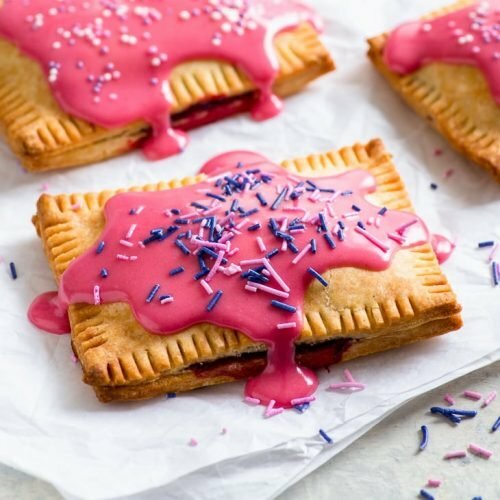 If you’ve been round these parts before, then you know that I use the raspberry reduction (essentially a highly concentrated juice of fresh or frozen raspberries) all the time – in the raspberry glazed pop tarts, the vegan sugar cookies frosting and the raspberry & chocolate Valentine’s cupcakes. 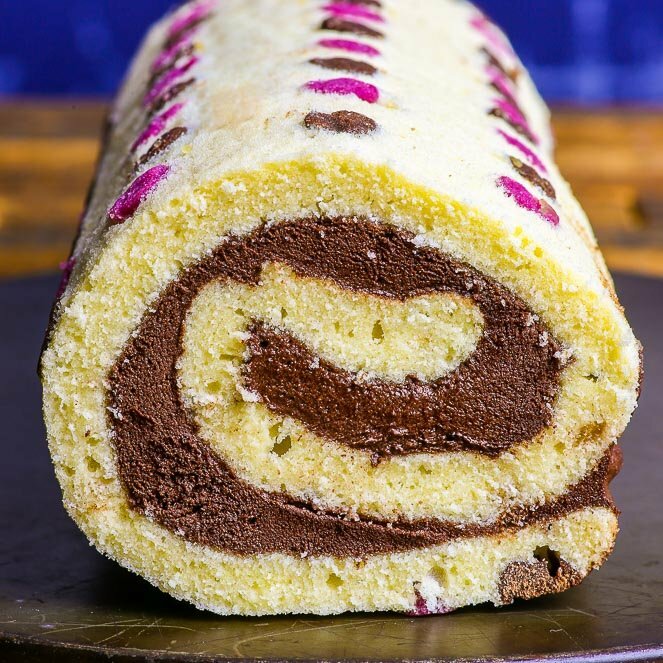 A vibrant, refreshing glaze with an intense raspberry flavour and the most gorgeous pink colour. 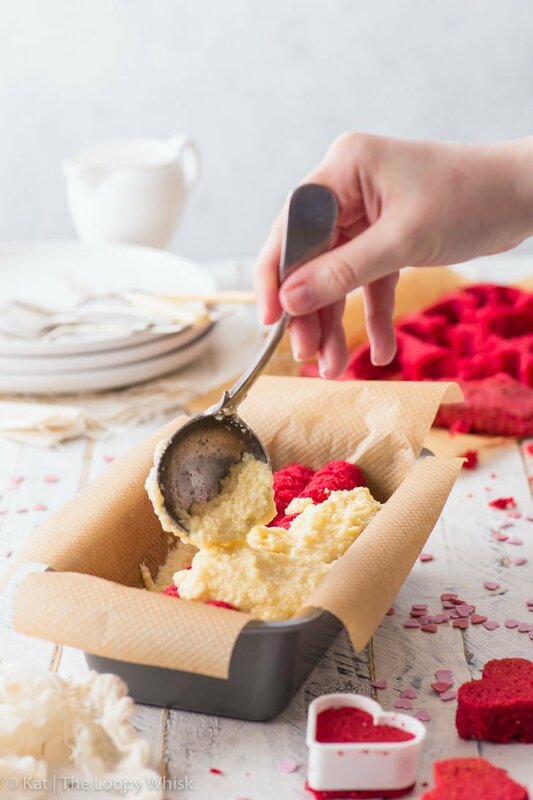 The tartness of the lemon juice and the raspberries balances the sweetness of the sugar, preventing the drizzle from being too sickly sweet. My favourite part is definitely when the icing has dried and hardened into this wonderful crackly sweet raspberry shell that just melts on your tongue. Seriously, so delicious. 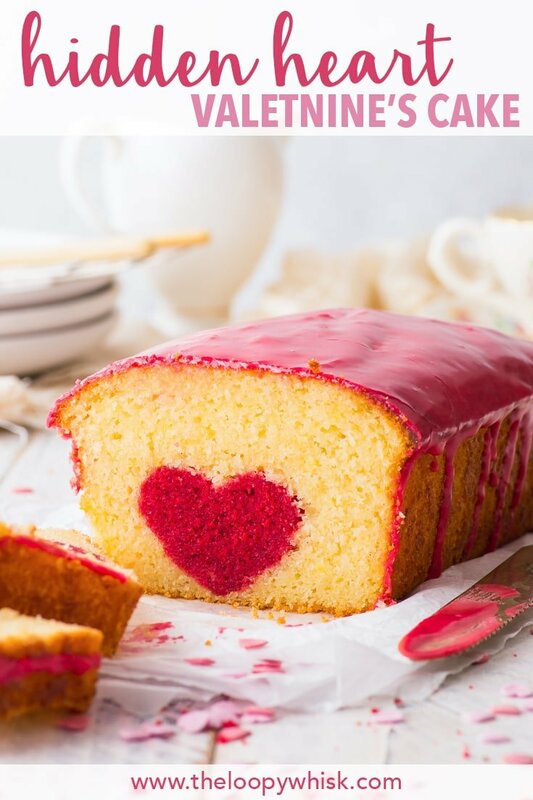 In fact, the whole hidden heart Valentine’s cake is just a joy – to make, to look at, and (most importantly) to eat. Plus, when you cut that first slice and the hidden heart design is revealed… well, you feel rather like a baking super(wo)man. And that feeling, my friends, that’s the mark of a truly wonderful dessert. Return the raspberry juice to the saucepan and cook further until it has decreased in volume to about 5 tbsp. Pre-heat the oven to 355 ºF (180 ºC) and line a 8 x 8 inch (20 x 20 cm) square baking tin with greaseproof/baking paper. In a large bowl, sift together the gluten free flour blend, almond flour, xanthan gum and baking powder. Add the sugar and salt, and mix until combined. Add the softened butter and, using either a stand mixer with the paddle attachment or a hand mixer with the double beater attachments, work the butter into the dry ingredients until you get a texture resembling coarse breadcrumbs in size. In a separate bowl, mix together the eggs, milk, raspberry reduction and vanilla. Add the wet ingredients to the dry+butter mixture, and whisk/mix well until no flour clumps remain and everything is evenly distributed. 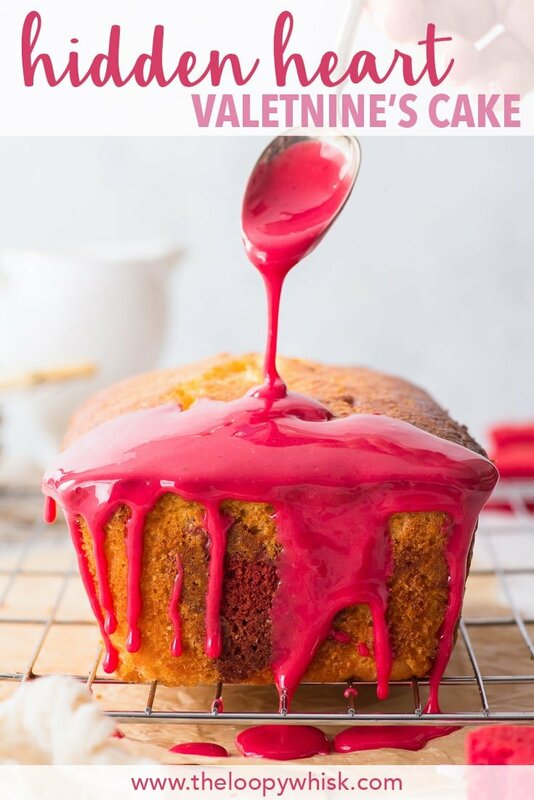 Add the red food colouring or (sifted) beetroot powder to make the colour more intense. 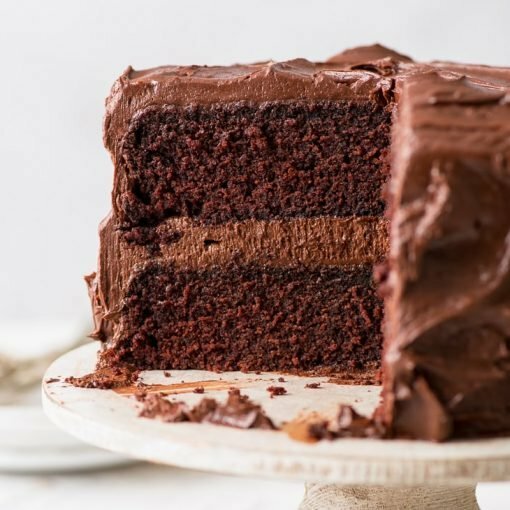 Transfer the cake batter into the lined baking tin, smooth out the top, and bake in the pre-heated oven at 355 ºF (180 ºC) for about 22 minutes or until an inserted toothpick comes out clean. If the cake starts browning too quickly or too much, cover it with aluminium foil and continue baking until done. 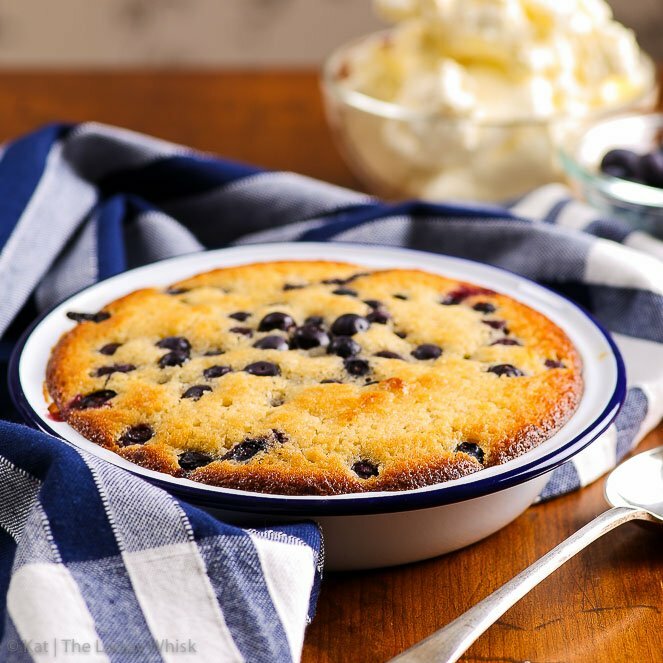 Allow to cool in the baking tin for about 10 minutes, then remove from the tin, and allow to cool completely on a cooling rack. 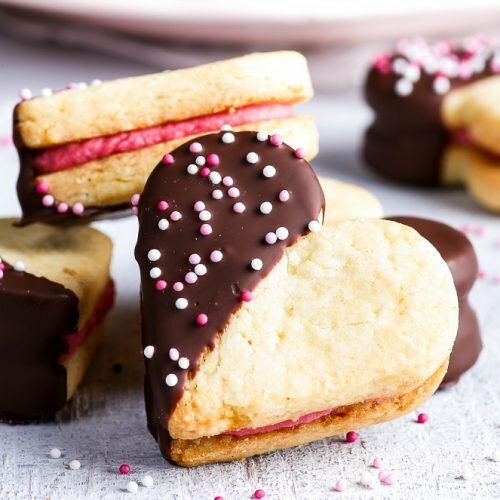 Once cool, use a heart-shaped cookie cutter to cut out pink sponge hearts. 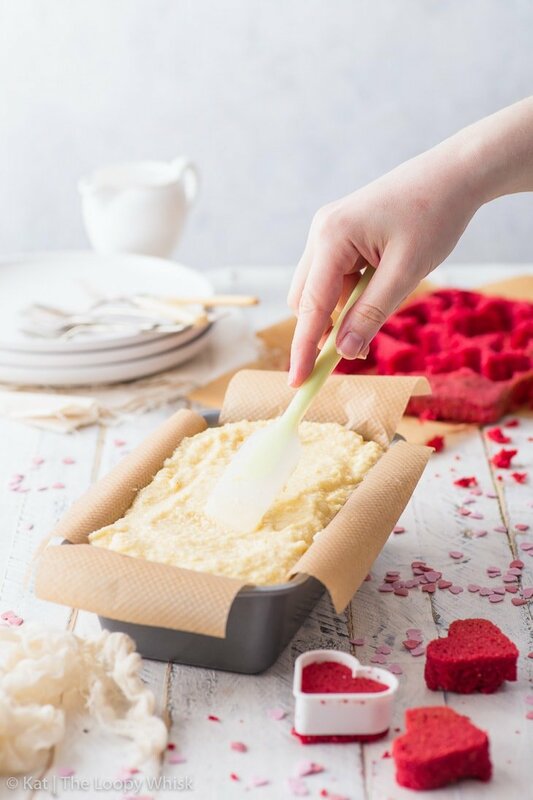 You will need enough sponge hearts to make a row spanning the length of the loaf tin you'll use. Add the lemon zest. In a separate bowl, mix together the eggs, milk, vanilla and lemon juice. Add the wet ingredients to the dry+butter mixture, and whisk/mix well until no flour clumps remain and everything is evenly distributed. Transfer some of the cake batter into the prepared loaf tin, just enough to create a thin layer of batter at the bottom. 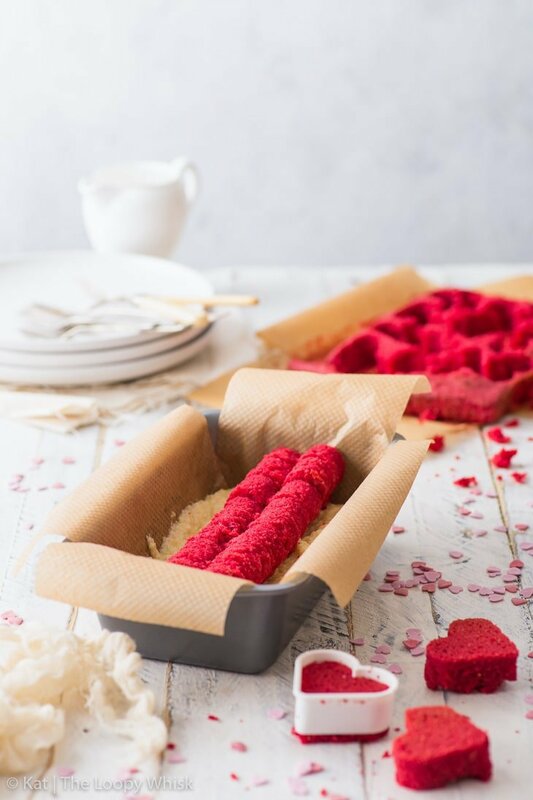 Arrange the sponge hearts in a row along the middle of the loaf tin (see post above for photos). Pour/spoon the rest of the lemon batter around and over the row of sponge hearts, smooth out the top, and bake in the pre-heated oven at 355 ºF (180 ºC) for about 1 hour or until risen, golden brown on top and an inserted toothpick comes out clean. Allow to cool in the loaf tin for about 10 minutes, then remove from the tin, and allow to cool completely on a cooling rack. Stir the powdered sugar and 1 1/2 tbsp of raspberry reduction together until you get a thick even mixture. Add 1/2 - 1 tbsp of lemon juice, mixing well, until you get the correct icing consistency (see post above for photos). You can add more lemon juice to make it runnier, or more powdered sugar to make it thicker, as required. 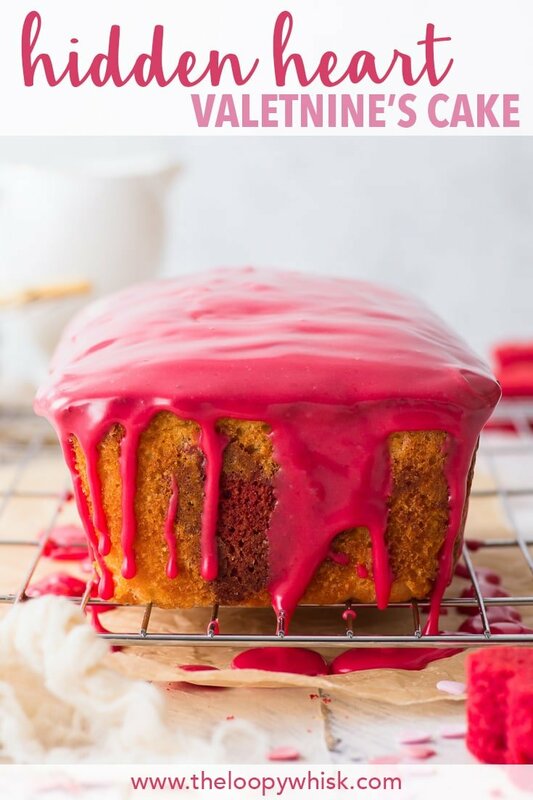 Drizzle the raspberry icing over the cooled cake, spreading it evenly across the top with the back of a spoon, and letting it drip down the sides. The hidden heart Valentine's cake keeps well in a closed container in a cool dry place for 3 - 4 days. 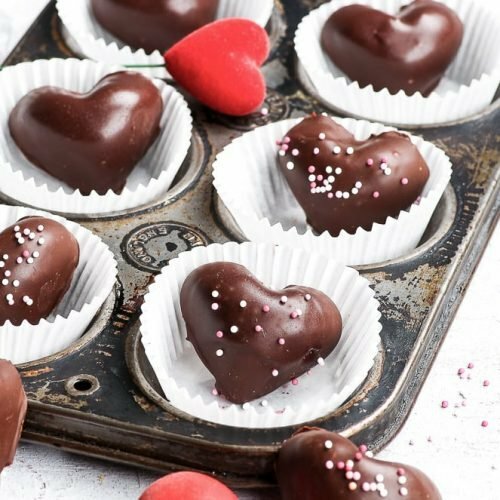 Looking for more delicious & romantic desserts? Such an adorable recipe! 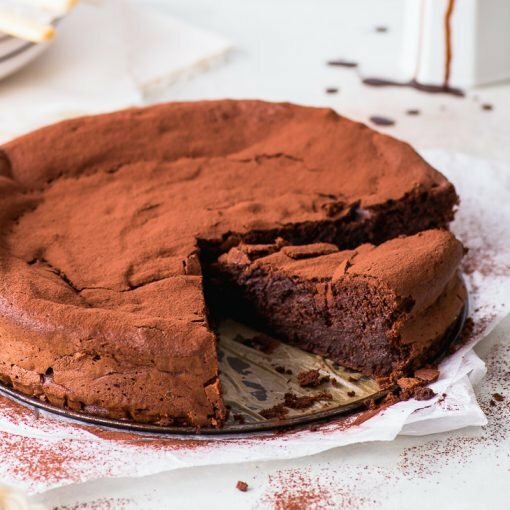 Can i sub GF flour & almond meal for AP flour and omit the xanthan?